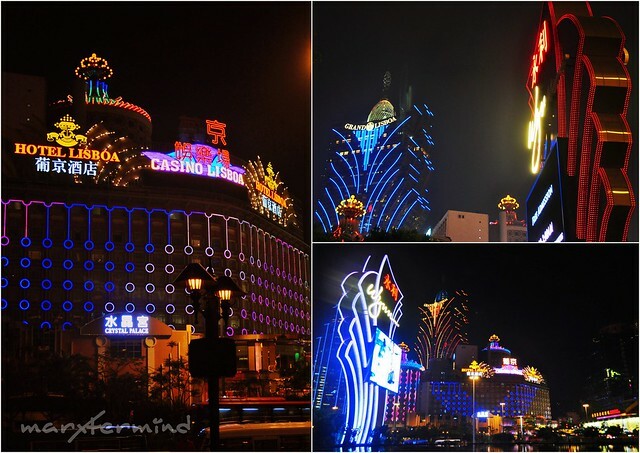 If you were impressed by how elegant Macau hotels are then be amazed how these hotels look like at night. 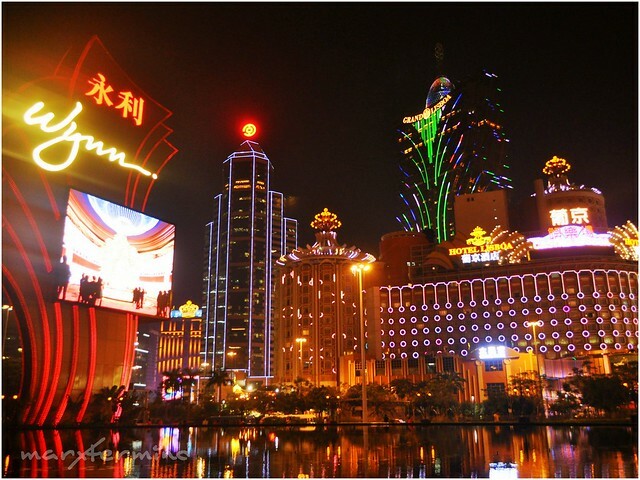 Each hotel and building has its lights to show off making them more dazzling. The bright lights are overwhelming, they are everywhere. Each has its own to show. I was really in awe seeing those lights. I couldn’t help but to take a lot of pictures of it. 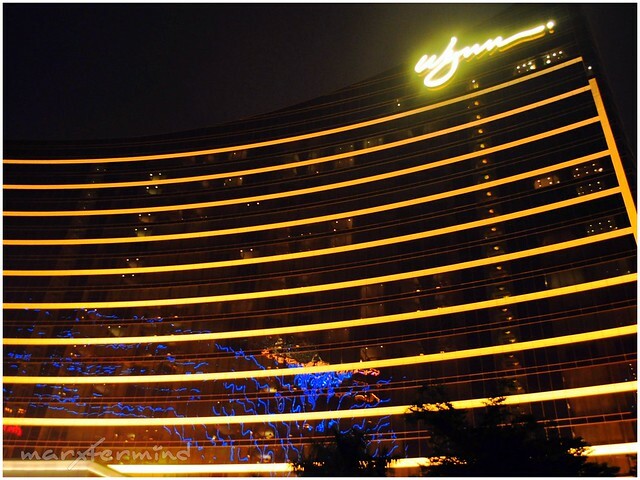 We went towards the Wynn Hotel upon arriving at MGM Hotel to catch the Dragon and Tree of Prosperity show. We had no plans to watch the Performance Lake at the Wynn Hotel again since we were able to watch it earlier but these scenes made us stay. It was worth watching the fountain show again. The lights and sounds were synchronized making it perfect to watch. It was indeed better than what we were able to watch earlier at daytime. It must be the lights. 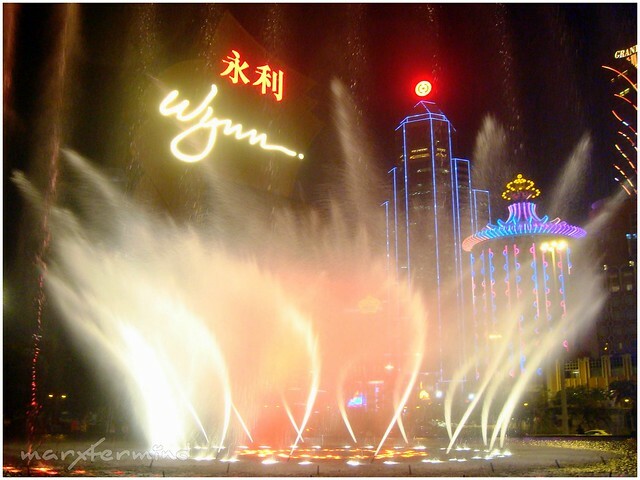 This show shouldn’t be miss when visiting Macau, particularly Wynn Hotel. Afterwards, we entered the hotel lobby and looked for the atrium where the Dragon of Fortune show and Tree of Prosperity show happen. The show takes place every 30 minutes alternately. We were able to witness the Dragon of Fortune show first. Good thing we arrived 10 minutes earlier before it got surrounded by people. My heart was pounding when the show started. Feeling excited? It wasn’t splendid but it was amazing. I was really impressed. 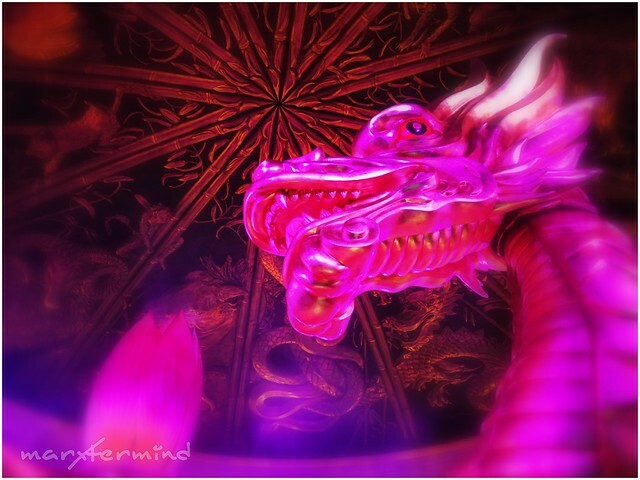 The imaginary fire came out from the ceiling and this huge dragon structure from the underground. 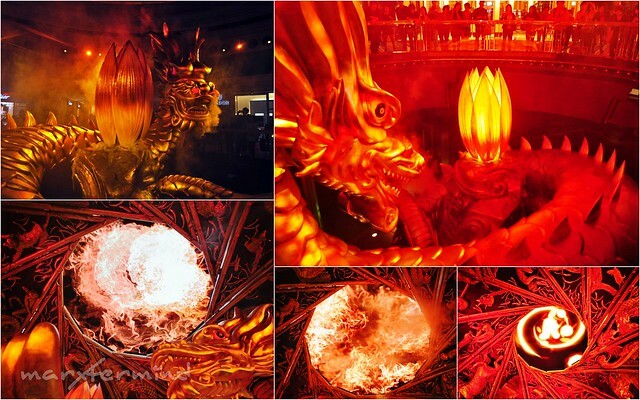 They say it symbolizes vitality, good fortune and well-being, the Dragon of Fortune combines traditional sculptural art, modern lighting and audio effects in a dramatic display. The show ended and we waited for another few minutes for the Tree of Prosperity show. Five minutes before the show we went back to the atrium and it was about to start. It was crowded and still we were able to secure our place to watch it. The ceiling had opened with something like this. I didn’t know what’s this one for but it was like chandelier. Then the ground opened, then a tree came up. This is where the huge dragon came out, too. I wondered where’s the dragon now. 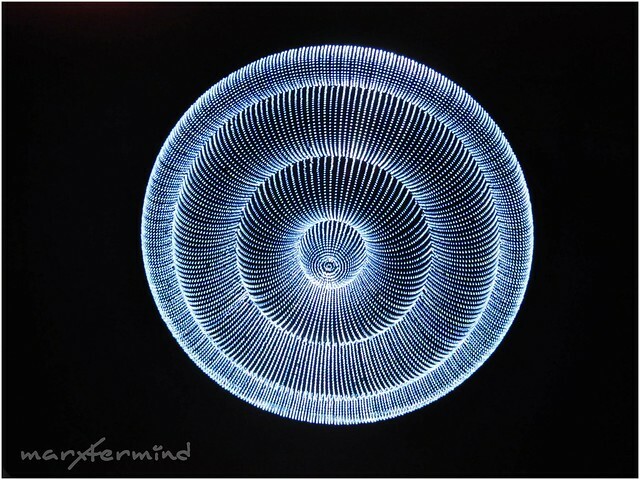 The light changes every time into different colors that corresponds the four season. 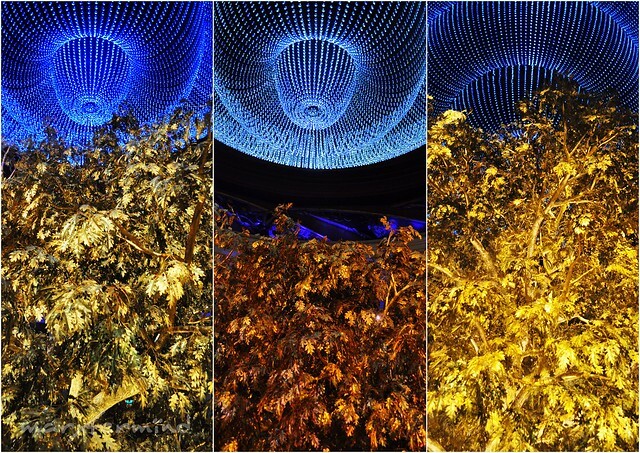 The Tree of Prosperity is a choreographic masterpiece of shimmering, sculptural patterns, music, video and light depicting Chinese and western astrological symbols. I tossed a coin and made a wish for good fortune. The show ended and we went out from the hotel. We moved to our next destination which is Macau Fisherman’s Wharf. We planned to take a cab but still hesitant since we’re still looking and hoping for a free ride to get there. No signs of free ride to get there so we decided to walk. We used the map for direction. 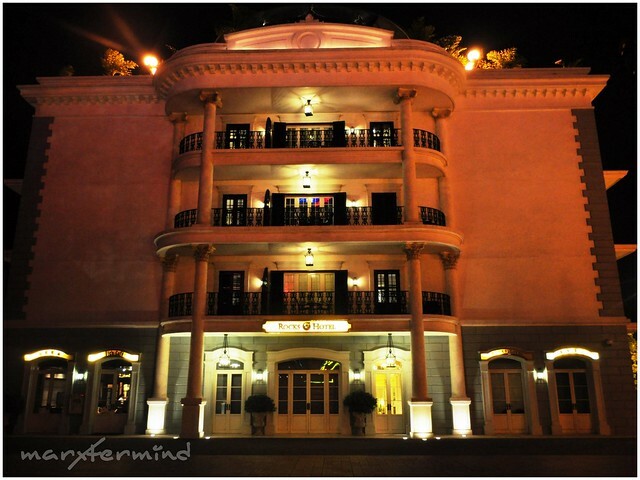 We walked at the Avenide de Amizade towards the Macau Fisherman’s Wharf. It was another long walk to get there. It took us 15 minutes to get to our destination. My feet was already killing me and I was too tired to take a good photo. There were only few people around when we got there maybe because it was already dark and it was Sunday! Macau Fisherman’s Wharf is a themed park and shopping place in Macau. 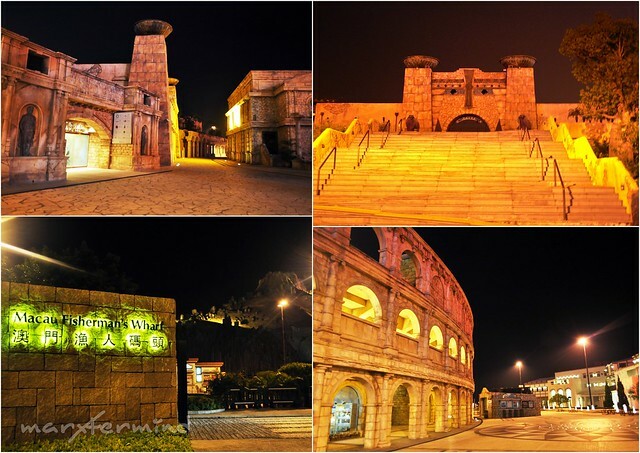 It is said to be the first theme park in Macau. 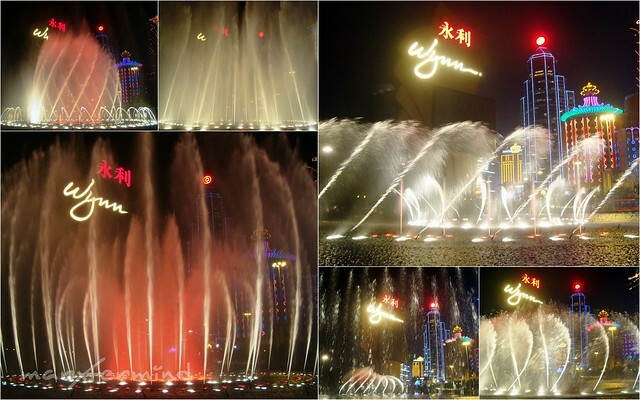 It is a free admission entertainment complex. Due to tiredness we didn’t check the attractions anymore. We went towards the Roman Amphitheater which really interests me because of the structure. 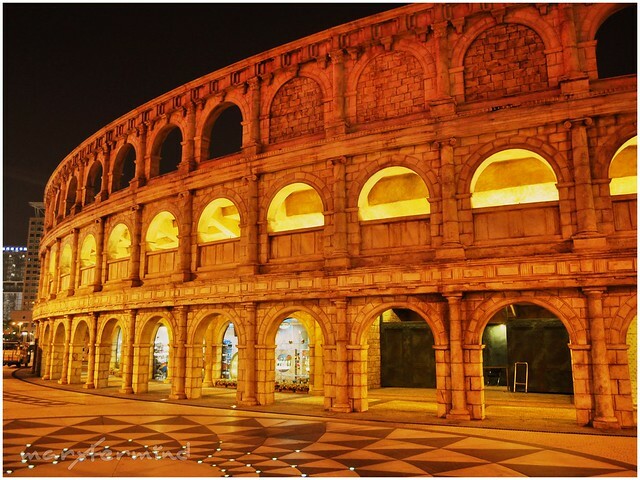 The Roman Amphitheater is an outdoor Colosseum equipped with 2,000 seats, designed as a venue for concerts and other performances. The structure reminds me of another Roman Amphitheater somewhere in Europe. Is it in France? Anyway, it was really a good venue to take some photo ops but I was not in the mood anymore. I was hungry and tired from our all day transfers and walking. Afterwards, we moved to this avenue where shops and restaurants can be found. Most were already closed, I wonder why. So we just walked until we reached the end. The end of the path is where the Rocks Hotel is. We took a seat for awhile to rest. It was a relief! 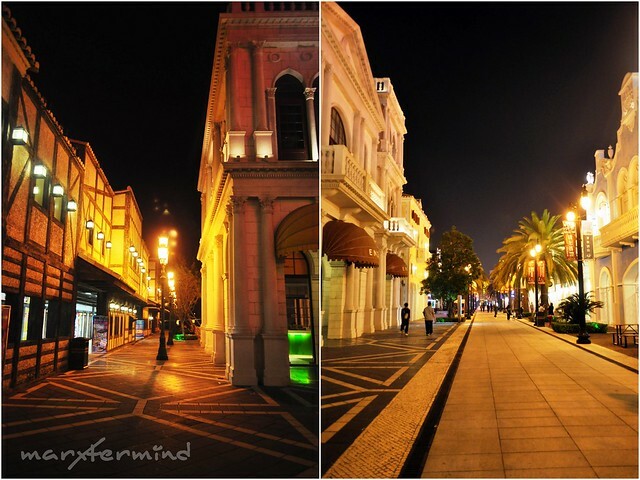 I found Macau as a small region but full of culture, art and entertainment. 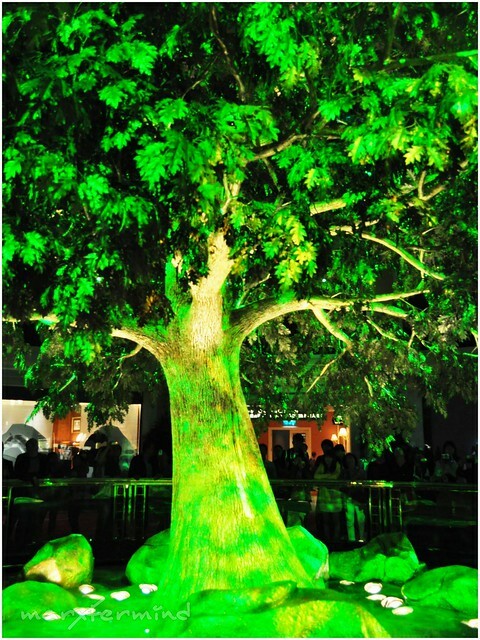 The lights are really charming and splendid making the country glows brighter. Hotel stay, casino and night life are things I missed for this trip. I know we’ve been to a lot on our day trip in Macau but a day still isn’t enough to enjoy the country to the fullest. 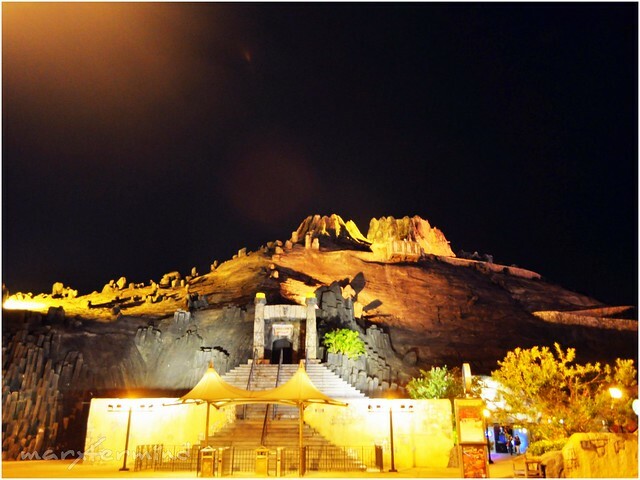 There are still more attractions to visit and activities to experience. We decided to leave and take a cab at the bus stop nearby the hotel. Surprisingly, the bus stop is for the hotel’s free shuttle bus. So we rode the free shuttle bus going to the Macau Ferry Terminal. We really saved a lot of money on transfers. We took the 9:00 PM ferry back to Kowloon, Hong Kong. That time we purchased ferry ticket from Turbojet which costs HKD 174.00. Night time ferry ticket is more expensive than day time ferry ticket. The ferry ride back to Hong Kong was bumpy due to waves. Number of passengers were already experiencing motion sickness and so I was. I was kinda feeling dizzy already. Good thing, I haven’t eaten my dinner yet so I have nothing to puke. We arrived in Hong Kong safely after an hour. We roamed the streets and looked for a good place to eat but ended up eating in McDonald’s. Macau has two ferry terminals, one in Taipa Island and the other one is in Macau Island or Macau Peninsula where Outer Harbor Macau Ferry Terminal is. It’s better to take the Macau Ferry terminal if you’re already in the Macau island rather than going back to Taipa. Hong Kong has also two ferry terminals, (1) Hong Kong Macau Ferry terminal located in the Hong Kong Island and; (2) Hong Kong China Ferry Terminal located in Kowloon Hong Kong. Know where’s the best terminal fits your itinerary. @Malditang "Kura"cha, Hahaha! Thanks! Mas madali sana if may tripod. hong ganda… wala na naman akong masabi. ang galing galing mo kumuha ng naka night mode. bongga! Sana dnagdagan nila ng costume ni Goku yung dragon para mas kahindik-hindik! hahah!